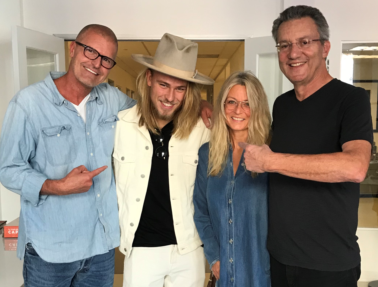 Sony Sweden artist Juliander, just off a European tour with Zara Larsson and in town for showcases and meetings, stops by the HITS offices in Hollywood, where Editor in Chief Lenny Beer promised to introduce him to at least two of the five Spidermen working the Boulevard. Later, manager Tom Maffei's golden retriever hooked up a sync deal. Seen recalling the riveting early gigs by Daniel Ek's ska band are (l-r) Maffei, Juliander, Juliander's mom, Bente Palmgren, and Beer.